Do you struggle eliciting a high number of repetitions in articulation therapy? It can truly be a challenge, especially when you have mixed groups or large groups! 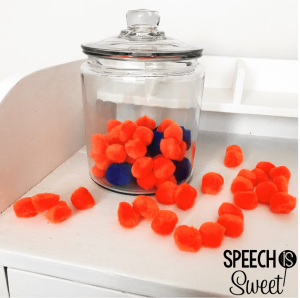 We know that repetitive drills are critical for success in speech therapy, but how do we motivate students to reach a high number of drills in just 20-30 minutes? 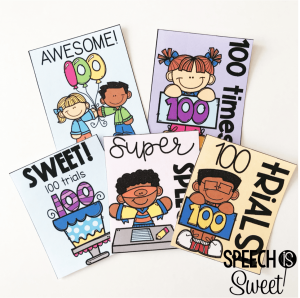 Today, I’m sharing five ideas to motivate your students to reach 100+ repetitions! We all love extrinsic motivation! I know I’m more likely to enjoy a staff meeting when snacks are provided! haha! I love these articulation badges, because they’re a super simple way to encourage students to reach 100 trials! At the beginning of your session, show students the badge they can earn! If they reach 100 trials, they get to collect the badge! I whipped up these articulation badges for members of my email community! They come in color ink and black & white. If you would like these to use with your students just sign up for my newsletter! You’ll receive an email that will lead you to my free resource library! Games are highly motivating and fun! I do find it challenging to use board games in large groups though, because sometimes there is too much focus on what’s happening with other people. haha. You know what I mean? That’s why I love games that are designed to be used independently! There’s no waiting around for other people to take their turn and I feel students focus more! Eliminating distractions is key to eliciting 100+ trials in articulation therapy! 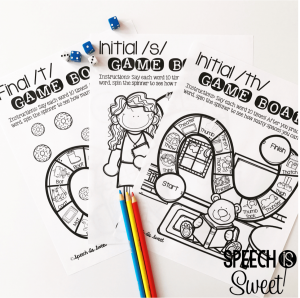 You can snag these free no prep articulation game boards in my TPT store by clicking HERE. I also have a bundle that features 888 unique game boards – students will love collecting them! I’ve also creating another game that is designed to be used independently – Spin-Go Articulation! 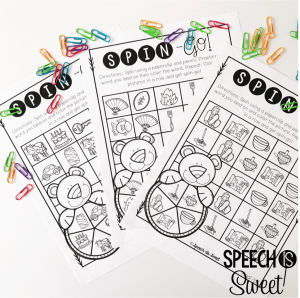 Students spin the spinner and then practice the word that they land on! After they practice the word, they can then color it on the board! When they color five in a row, they’ll get spin-go! This is such a fun and novel game – my students loved these! You can snag a free version here or check out the bundle that features 11 different themes! Another tip – increase the number of repetitions required for each turn! If you generally require five repetitions, double it to ten! If they normally say their word ten times, double it to 20! Typically, I always required 20 repetitions! That is a sure-fire way for students to obtain lots of practice! This is a super cheap idea and it’s highly motivating for students! Every child loves stickers! I recommend buying a variety of sticker books from the Target Dollar Spot or Michael’s! They’re usually only 99 cents or so! Put all the stickers books in the middle of the table and tell students that they can earn one sticker for each repetition! They’ll be highly motivated to fill their sticker book with 100 stickers before the end of their session! They also get to leave speech with a really cool sticker book! You can have students make sticker books multiple times per year – this activity will never get old! I whipped up a free sticker book template for you – you can snag it by clicking HERE. Crafts are highly motivating! Crafts can be time-consuming to prep, but students love them! I created some no prep crafts as a compromise! While students wait for their turn, they can work on coloring, cutting, and gluing! Once students can practice independently, you can even have them drill while they are putting their craft together. I made a craft packet unique for each speech sound (for instance, the /k/ packet features a castle and a can). Each packet features items in the initial, medial, and final positions. For instance, the /s/ packet has a sock craft, pencil craft, and a bus craft. You can check out the bundle here – you can collect all 23 sounds or pick and choose the packets you need! Altogether, the bundle features 575 crafts! Everybody loves a challenge! You’ll just need a cookie jar and some craft pom-poms! Challenge your articulation group to fill the cookie jar with pom-poms before the end of their session! They’ll get one pom-pom for each repetition! This is also a great way to keep students focused between turns! After they work one-on-one with you, they can then count out their pom-poms and put them in the jar! You can even have students pick up the pom-poms with tweezers or tongs to add in some fine-motor practice! 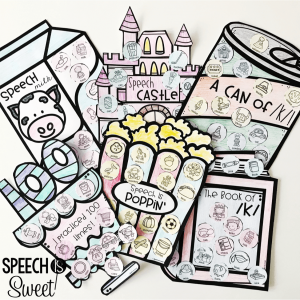 This activity will also help build a sense of community in your speech groups, because everyone has to work together to get the cookie jar filled! Do you have any fun ideas to encourage students to reach 100 trials? I would love for you to leave a comment and share! Thanks for stopping by! Have a wonderful day! I love the cookie jar idea and how you can add fine motor skills to it! My OT’s would have loved this idea since it is a easy way to collaborate! Thanks for including the link to my post and additional ways to motivate kiddos to get those trials in!